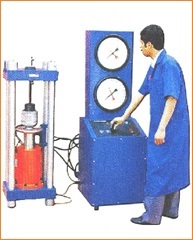 The machine is widelly in concrete and steel material testing. Suitable for concrete testing cube 15 cm, 15 x 30 cm dia, steel 6 to 16 mm bar diameter. Four coloum steel frame, twin gauges it adopts analog dial manometer to display test result. The hydraulic loading system is controlled manually by the hydraulic valve, variable speed. Bagikan informasi tentang Mesin Uji Tarik Baja + Tes Kuat Tekan Beton kepada teman atau kerabat Anda.